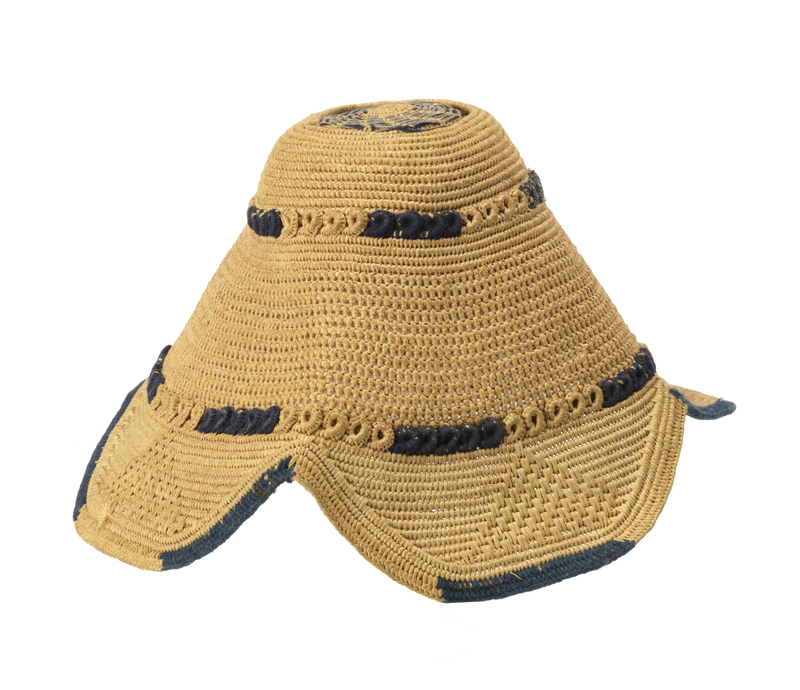 See more objects with the tag circles, identity, status, headcovering, scallops, men's fashion accessories, hat, initiation, Kuba, African. See more objects with the color darkkhaki burlywood peru sienna darkslategrey or see all the colors for this object. 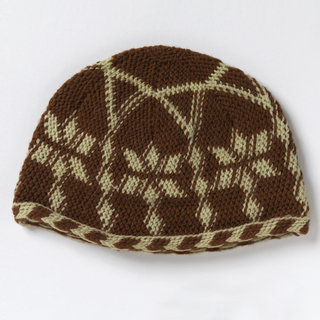 This is a Man's cap (laket). It is dated late 19th–early 20th century and we acquired it in 1957. 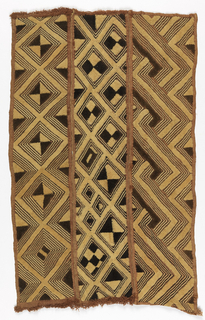 Its medium is raffia, wool and its technique is simple looping and twisted looping over a foundation element; embroidered with buttonhole stitches. It is a part of the Textiles department. 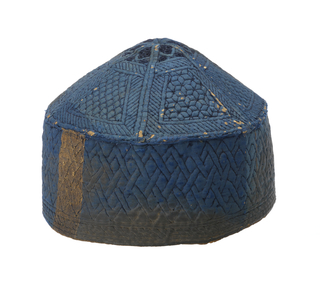 Among adult Kuba men, the laket — a small conical cap characterized by four lobes along the lower edge— is the most common type of headwear. It is worn perched on the crown of the head and secured with a long iron or brass pin through a tuft of hair reserved for that purpose. 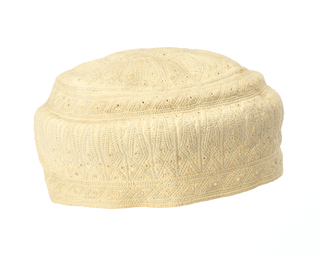 Made exclusively by male specialists working with a single needle, laket are noted for their subtle ornamentation, which may include small amounts of dyed raffia or wool embroidery and areas of openwork. Further embellishments such as cowrie shells, beads, animal skins, or feathers may be added to this basic form as additional titles, responsibilities, or honors are conferred. 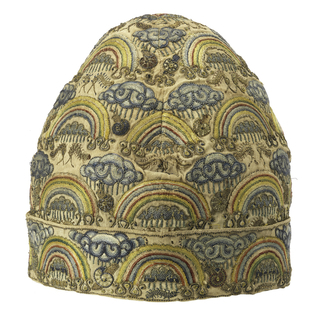 Caps with a large raffia pom-pom on each lobe are worn exclusively by titled soldiers known as iyol. Patricia Darish and David A. Binkley, “Headdresses and Titleholding Among the Kuba” in Crowning Achievements: African Arts of Dressing the Head, ed. Mary Jo Arnoldi and Christine Mullen Kreamer (Los Angeles: Fowler Museum of Cultural History, 1995), 165.